Recently I read a post over at Let Why Lead about shame triggers. If you haven't read it yet I highly encourage you to. It really got me thinking. At first I didn't think it applied to me because I don't have anything to be ashamed of, but she discusses some of what Brene Brown teaches about shame. She said, "But as I continued to read and listen to Brene talk about her research, I learned that shame for most of us is just that quiet feeling of "not enough"". This hit me hard because it really is something I can feel. Now overall I know who I am. I know I'm a daughter of a loving Heavenly Father and that He loves me, I have a family who loves me, and overall I've got it together. But I also have no problem pointing out to people what is wrong with me, what qualities I don't have, and what parts of my life where I feel like I'm failing. 1. Not kind and loving enough. I'm kind of a sarcastic person and most of the time I love my humor but sometimes I don't. I wish I was that girl who was more loving and kind to everyone. Do I talk about others to much? Do I complain too much? Do I always put myself first? Do I put others down to often in the hope I will get a good laugh? 2. I'm not exciting enough. I hate the questions "what did you do before this job? ", or "what do you like to do?". I've never left North America, I'm back living at home again, I served my mission in my home state and I don't have any big obvious talents. I always hate talking about myself because I feel like everyone else is living the dream and has exciting things to share while I'm just this average Jane just trying to find my thing. Talk about serious shame. I look at what I haven't done instead of what I have done. 3. I'm not pretty/fashionable/creative enough. Pretty shallow I know but I'm being authentic here so I'm going to be honest. I follow all of these lifestyle/fashion blogs and I see these women and I think "what is wrong with me?" or "why am I not more girly and cute?". I find myself thinking I'll never look like that, or no matter how hard I try I'll never be able to decorate a home that cute. When why does that matter? I should rejoice in my own uniqueness! Sadly I could go on. Erica on Let Why Lead said , "Wholehearted people know what qualities they don't have, but they wake up every morning and still feel "enough"". I think that is so true. They know they need to keep working and growing to be better that day but in the end they know I did my best. Now I need to figure out how to overcome my "Shame Triggers". You're completely right Havalah! Soon their will be a post on how knowing our weaknesses can make us stronger! The first step is talking about them, because as Brene would say, shame can't stand to be spoken. So you're already halfway there! 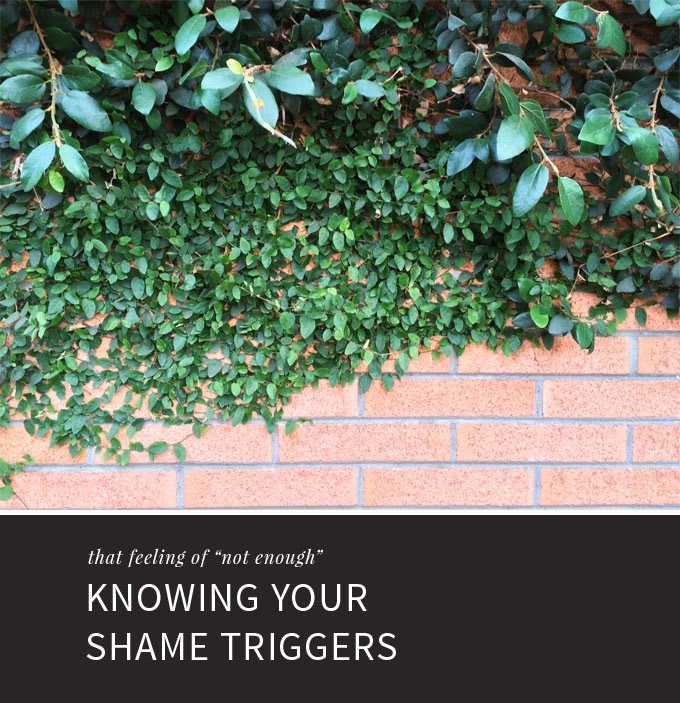 I'll be writing more soon about shame triggers, and I can't wait to share this post. You have a great weekend! I am capable. etc. etc. I could send the whole list, which number 147, but you should write your own and then say them out loud as often as possible. We never talk about the weaknesses. Who wants to "own" them. Later in the workshop, we go on, "I am caring. For example, I volunteered a night at the shelter (or whatever) . . . . " and "As a result, I helped . . . . "
If you've never heard of the LDS Employment Resources Career Workshop, you'd ought to ask your bishop if he knows where it is in your area. We're actually doing part of the workshop at a YSA regional conference on July 26th.